Ankle injuries are common in football. The most common ankle injury is an ankle sprain, usually of the lateral ligaments. Associated injuries include syndesmotic tears, fractures and osteochondral defects. Most patients can be treated conservatively. However, it is important to distinguish a simple distortion from a more complex but sometimes subtle ankle injury, since adequate treatment is associated with a better prognosis and time to return to play. This chapter describes the most common ankle injuries in football. 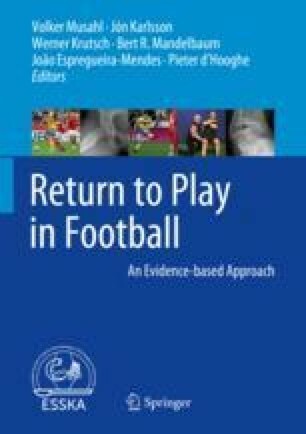 Anatomy, epidemiology, clinical presentation, diagnostic approach and treatment are reviewed for a safe return to play. Frank G. J. Loeffen and Yoshiharu Shimozono contributed equally to this work. Vereijken AJ (2012) Risk factors for ankle sprain injury in male amateur soccer players: a prospective cohort study. http://dspace.library.uu.nl/handle/1874/252485. Accessed 4 Jan 2017.